World Environment Day is a global initiative that sets out to show how every action counts when it comes to creating a positive environmental impact and reducing harmful activities. Taylor Woodrow teams demonstrated this by sharing environmental knowledge and implementing a number of unique greener energy techniques in the process. The Victoria Underground Station upgrade team organised various talks, including Sustainability in Construction, Where the Project’s Waste Ends Up, and What Lies Beneath London Victoria. At Tottenham Court Road, 5kg of carbon dioxide was saved by appointing an environmental champion to remind and encourage as many people as possible to switch off their PCs and printers between 12noon and 1pm. 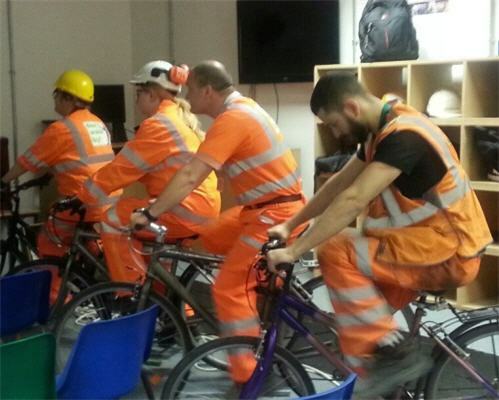 The station’s upgrade team also installed a pedal powered cinema for the day, where energetic bike riders created the electricity required to play environmental films. An interactive environmental quiz was held between screenings.